Manjhi, who quit NDA and made HAM an ally of the grand alliance in February, has reportedly identified seven seats from where he plans to field candidates in the 2019 Lok Sabha seats. A file photo of Former Bihar Chief Minister Jitan Ram Manjhi. PATNA: Former Bihar chief minister and prominent Dalit leader Jitan Ram Manjhi has sparked worries in the RJD-led grand alliance by staking claim to at least five Lok Sabha seats for his party Hindustani Awam Morcha (HAM). 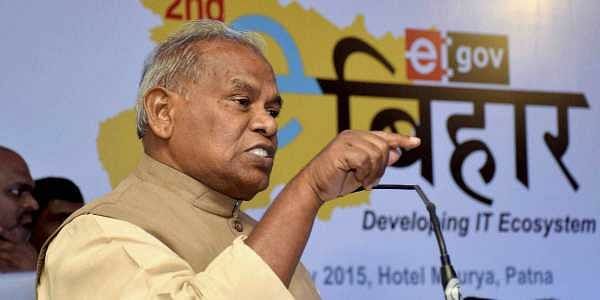 Manjhi, who quit NDA and made HAM an ally of the grand alliance in February, has reportedly identified seven seats from where he plans to field candidates in the 2019 Lok Sabha seats. HAM sources said he has put forth before RJD, the main party in the Opposition alliance, the demand to be allotted at least five of those seats. These seats are Jamui, Gopalganj, Gaya, Munger, Khagaria, Nalanda, Muzaffarpur, said the sources. Three of these seats are currently represented by BJP (Gopalganj, Gaya and Muzaffarpur), three by LJP (Jamui, Munger and Khagaria) and one by JD-U (Nalanda). RJD and Congress, however, appear unwilling to concede five seats to HAM, whose performance in the 2015 Assembly polls was lacklustre. Even though HAM contested as an NDA partner and fielded candidates in 21 constituencies, only one of them – Manjhi himself – managed to win, pointed out RJD and Congress leaders. Manjhi also wants the grand alliance to finalise the seat-sharing agreement among the three grand alliance parties – RJD, Congress and HAM. But RJD, which takes major decisions in the alliance, is in no mood to do so because it expects the two smaller NDA parties – Ram Vilas Paswan’s LJP and Upendra Kushwaha’s RLSP – to break away and join it before the LS polls, said sources. “Since rebel JD(U) leader Sharad Yadav’s new party and the Left parties are also likely to contest the Lok Sabha polls as part of the grand alliance, sharing of seats would be discussed at an appropriate time,” said a senior RJD leader. According to sources in RJD and Congress, HAM may be allotted only three of its chosen seats – the reserved seats of Jamui, Gopalganj and Gaya. Even though RJD leaders claimed that seat-sharing would pose no problems in the grand alliance, JD(U) leaders ridiculed Manjhi and predicted a “storm” in the Opposition combine in the coming months. “Despite having been a CM and a very senior leader, Manjhi has placed the post of CM candidate in the grand alliance before Tejashwi Yadav. He (Manjhi) is interested only in his family’s political progress. They will soon face a storm,” said JD(U) spokesperson Neeraj Kumar.